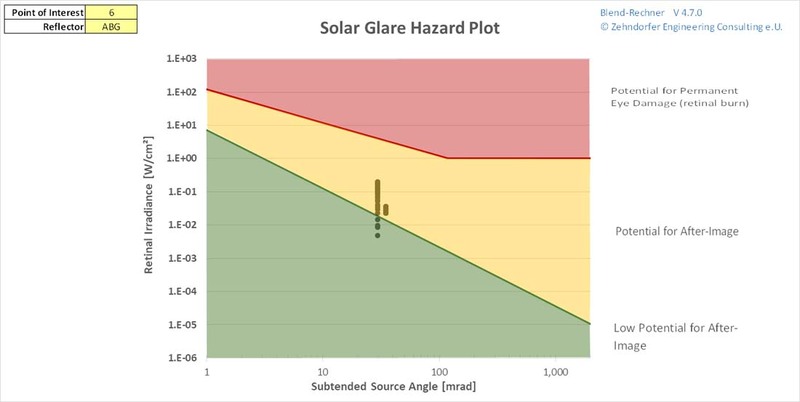 Every Solar Glare Assessment is based on a glare calculation, utilizing specialized software to calculate the path of reflected sunlight for the glaring hazard (e.g. the solar pv plant). It will first and foremost clarify, if and how long sunlight will be reflected in the direction of specific points of interest. This requires the exact registration of the local environment (x/y/z-coordinates and angles) of the reflecting surfaces as well as the point of interest. A topographical profile shows if direct rays of sunlight would at all be possible, or if they would be hampered by obstacles such as raised terrain, houses or trees. 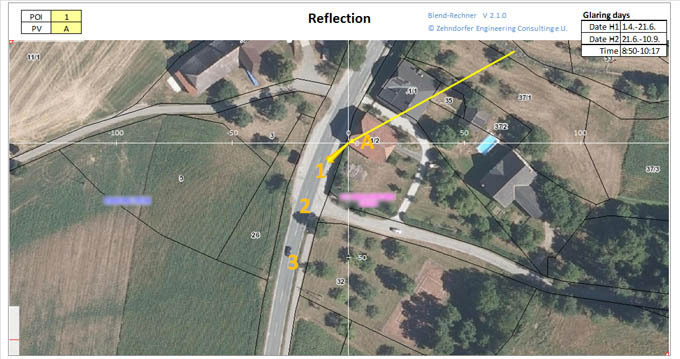 A detailed glint and glare calculation allows the optimization of reflecting areas. Small changes in the azimuth and slope angles of PV-areas can reduce or completely avoid glaring on certain points for instance. A glare calculation is the only means to quantify the glare hazard potential and thus provide a basis for a respective risk assessment. 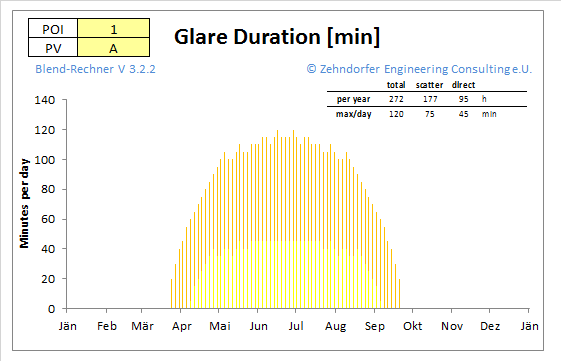 The glare-time diagram displays the distribution of potential glaring over the time of he year and the daytime. It shows if, when and how long reflection will be present. Thereby the duration of glaring in days per year and hours per day can be read from the diagram. The diagram also allows the simple illustration of the glare reducing impact of far-shading (e.g. mountains) or local shading measurements. The reflection trail sun - reflector - Point of interest shows the angle of a potential solar reflection. In some situations it becomes evident, that the necessary shown sun-position can never be reached (when the sun is too far north or when the point of interest lies behind the solar panel for example). Being a core result of any glare calculation, the duration of glaring (by direct reflection or scattered light) can be read from the glaring-time diagram. 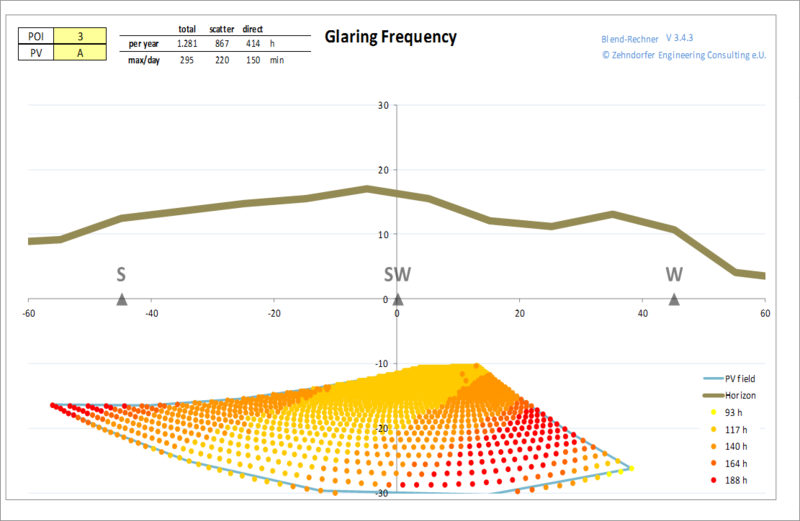 Only a professional glare-software can calculate the glare duration accurately. 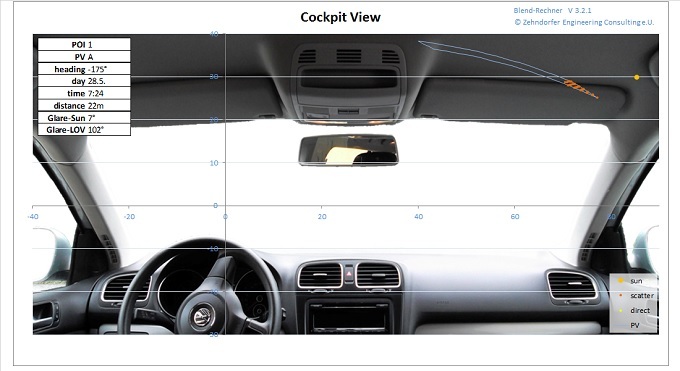 The cockpit-view shows the virtual view of the reflecting area from the car. Also sun-position and reflections are displayed in this illustration. This representation of the numbers obtained by the glaring calculation provides for a more intuitive understanding of the facts by the client, the surveyor and the verifying authority. The glaring frequency plot shows the distribution of reflection points across the reflecting surface. This allows an assessment of the complete surface and such is the basis for optimized and effective counter measures. Shading, obscuring or otherwise changing the surface can now be focused on where it counts most. 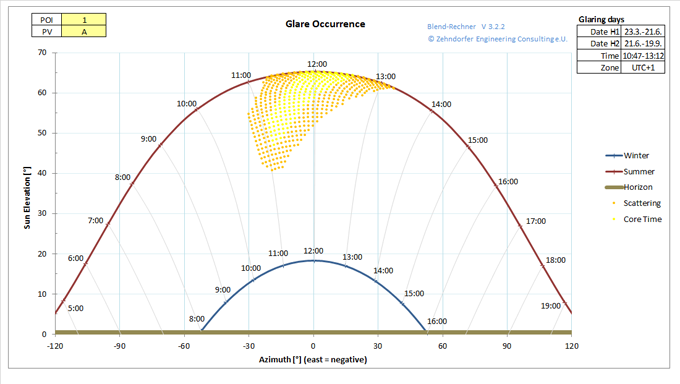 The Ocular Glare Hazard Plot has been developed to show the potential impact of a glaring hazard on the human eye. It is calculated with the time dependent intensity of the sun and the reflection coefficient of the reflecting surface. A glaring hazard is rated depending on two logarithmic scales - the power and the visible size of the reflections. These values are compared to limits that had been determined in experiments to cause temporary after-images or the permanent damage of the eye.